Metabolic diseases such as type II diabetes and fatty liver are becoming more prevalent among an aging population, and are a burden to the healthcare system. Such diseases revolve around the body's ability to control triglyceride (lipid) metabolism. Events such as fasting can lead to cell autophagy, corresponding with removal of lipid droplets. A number of pathologies can lead to steatosis, bringing about triacylglyceride buildup and release of free fatty acids and free glycerol. Glycerol molecules can then be reabsorbed by the liver or kidney and can be metabolized to re-enter the energy store by pathways such as glycolysis and gluconeogenesis. The glycerol concentration can thus be used as a measure of lipid metabolism and fat mobilization. The Glycerol Cell-Based Assay Kit provides a simple, sensitive, straight-forward assay for determination of glycerol concentrations in various cell and tissue culture samples. The assay uses a glycerol-specific enzymatic reaction to convert the probe into a fluorescent product in the presence of glycerol. Glycerol levels can be detected as low as 50 pmol per well, or 1.0 µM in culture medium. Chloroquine (included in the kit as a control) induces steatosis and blocks autophagy, thus leading to a buildup of lipid droplets and an increase in the free glycerol concentration. The kit can detect 100 pmol of glycerol in mammalian cell cultures. Chloroquine Treatment: HepG2 cells were plated overnight at 1E4 cells per well. Cells were then treated with chloroquine for 48 hours according to the protocol. 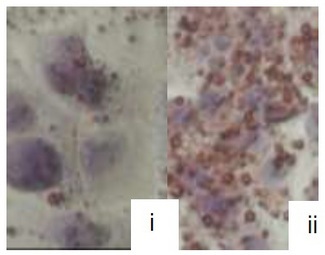 Oil Red Staining: HepG2 cells were untreated (i) or treated with 100 µM chloroquine (ii) and, after 48 hours, stained using Oil Red O lipid stain (LSBio, Cat. # LS-K586). 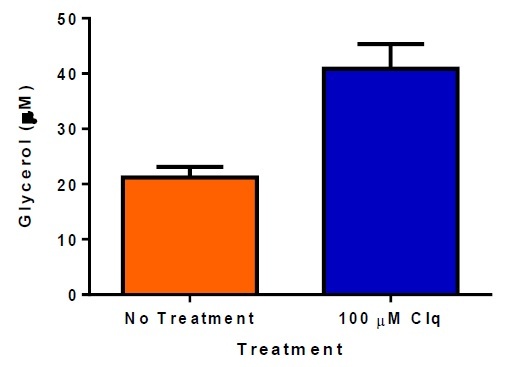 Treatment with chloroquine induces steatosis, leading to a significant increase in lipid droplets and glycerol content of the cells.